For the last several months, we at Voki have been working on an exciting and **top-secret** project, which we can officially introduce today. Very soon, we will be launching a major addition to Voki, something that will vastly improve the way teachers utilize Voki in the classroom. Voki Classroom is a classroom management system for Voki. We created Voki Classroom in response to numerous requests from teachers. Voki Classroom is designed to enhance the way you manage your students’ Voki assignments. In short, Voki Classroom helps students and teachers get more from Voki. Class Accounts. They are finally here! No longer will your students need to register with Voki to create their own accounts, using their own email addresses. Now you, the teacher, will be the one to assign each student’s Voki login information (created automatically). Since there is no need for students to register, you can spend more time on the lesson, and less time on creating accounts and helping students log in. Added benefit: This feature will enable students of any age to use Voki without sharing contact information. If they can use a computer, they can use Voki. Manage students. You can add and manage all of your students (up to 100) in Voki Classroom. Easily assign students to one or more classes, or review all of the Vokis created by a student. You can either add each student or upload a list of students. 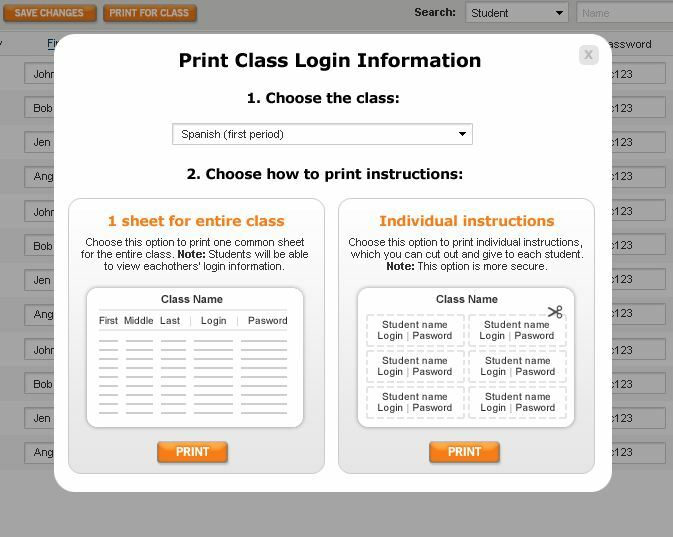 Tip: In this view, you can also print login instructions for the entire class, or separately for each student. Long-term discounts: choosing the longer term option (2 years vs. 1 year) will save teachers 25%. Multiple Accounts: to make Voki Classroom even more affordable, we’re enabling a multiple account discount for schools wishing to use 5 or more accounts. This discount will range from 10% (5 to 9 accounts) to 15% (10 or more accounts). This is in addition to the 2-year discount. Wait – what about Voki? So, what do you think? We’d love to hear your thoughts about Voki Classroom, the features we mentioned, and the features you’d like to see. Sounds like a great idea but the cost will determine the usefulness. There isn’t money in school budgets. Teachers will have to pay themselves. How do I go about adding a class list? I have a voki account.. I am in the process of planning how I want to implement voki next school year.. and would like to become familiar with how to add class, is this done through the regular voki account I set up?